Allow our lovely home to be your get away to the mountains where stress evaporates at our doorstep. The house is located on a 1/3 acre lot in a private cul-de-sac. There is easy access to Hwy. 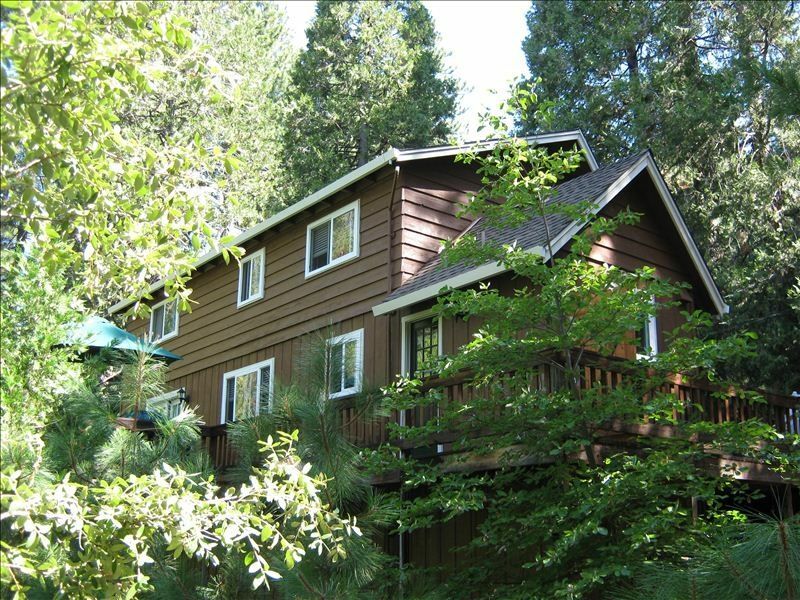 108 with Pinecrest Lake and Dodge Ridge Ski Resort 20 minutes away. We are near skiing, ice-skating, hiking, fishing, swimming, golfing, and boating. Mi-Wuk Village has several restaurants with accommodations to serve either breakfast or lunch. Twain Harte is 3 miles down the hill where there is a grocery store/deli, pizza parlor, Continental, Mexican and Chinese food restaurants. There is a miniature golf course, movie rental, antique stores and so much more. Black Oak Casino is less than 15 minutes from our home, where there is a state of the art bowling facility, a sports bar, restaurants and gambling. Our home features 3 bedrooms with 3 queen beds and an additional set of bunk beds in the kid's bedroom. The great room area has a wood burning fire place with an insert for cozy winter evenings. Wood is provided for the fireplace and will help to create the stress-free atmosphere you deserve. The kitchen is fully equipped with all the amenities of home. There is a utility room with a washer, dryer, and sink area. We have a large deck, where you can sit and relax for hours in our wonderful Mi-Wuk Village west side sunshine. The master bedroom hosts an antique dresser and grandfather's rocking chair along with a cannonball queen sized bed. The master is cozy and inviting. The kids bedroom is equipped with a TV, DVD, and VCR. (We have a collection of VCR movies.) This large room has a set of bunk beds and a queen sized bed. We also have a queen sized aero-type bed that can be utilized upon the request of our guests. Our third bedroom is downstairs. It is tastefully decorated and contains a cherry wood queen sized bed and matching dresser. Guests requested this feature, so we added WiFi in May 2012 to our home. It is with pride that we invite you to vacation at our special getaway. 2 The bathroom upstairs hosts a shower. The bathroom downstairs has a tub and shower combination. The view is peaceful and serene on our private 1/3 acre lot filled with pine trees and greenery. Our home is located in a cul-de-sac. Parking has never been an issue. We do not have a garage. White towels and wash cloths are provided for your stay. We have wireless internet in our home! There is a coffee maker with a grinder for coffee beans. There is a toaster oven. The kitchen is fully equipped. All you need to bring is the food!! We have two televisions. One is located in the living area and one is located in the children's room. Both are cable accessible. There are two DVD players located in the same area as the televisions. Games are located in the chest in the downstairs bedroom closet. There are 2 VCR's available in the same location as the televisions. We have a lovely deck with a patio table and 4 chairs, along with a galley table for a larger group. There are two golf courses within 20 minutes of our home. One is located in Twain Harte. The other is located in Sonora. Provided: Paper towels, toilet paper, garbage bags- large and small, ironing board, iron, blow dryer, make-up mirror, dishwasher soap, liquid dishwashing soap, bar soap, cleaning supplies, new sponge for dishes, ziplocks, foil, games,(outdoor and board), decks of cards, books for young and young at heart. Four free standing fans and two ceiling fans assure a comfortable climate in our home during summer. The Adair's cabin is comfortable and homey. We were 5 adults and 2 kids and a dog and we had plenty of space to relax and feel at home. All the bare necessities (plus many extras) were provided to make our stay pleasant and easy. The owners seemed like good folks. They sent us clear directions to and about the cabin and communication with them was accessible. We spent 3 nights here so that we could enjoy a ski vacation at Dodge Ridge, which is about a 30 minute drive from the cabin. The cabin is not fancy and it has some minor quirks, but we found it to be very comfortable and relaxing. We really had a wonderful trip and we would love to do it again next year! We had an amazing time in the Adair cabin! Everything was perfect!! Amazing instructions, lots of linens and the kitchen well provisioned - just bring food and everything you need is there to cook it. Our family had a great time!! Thanks Adair family!! I so enjoyed my trip to Mi-Wuk Village. There were six of us total and this house was a perfect fit! Lots of snow and the couple that own the home were very responsive to our questions and needs. The house felt very kid friendly. We are all eager to return! This home was the perfect winter escape. We stayed during a big storm, although plans had to be canceled due to the neighborhood streets being snowed in, we enjoyed our stay in the cabin. The driveway was a perfect sledding hill right in the front, the kids all loved having their own room, and the place was dog friendly. There are some restaurants and a little market within walking distance, so even though we were unable to drive, we were able to walk and get needed supplies (pizza and beer). Communication with the owners was superb. Highly recommend for one to two families! House/ cabin was clean, comfortable and inviting. It was easy to find. I would stay there again without hesitation. We had a lovely time at the cabin. It was spacious and clean and it had all we needed for an enjoyable visit to Mi-Wuk village. Although there are other homes close by, it still feels very private and scenic. The highlight of our stay was seeing an owl in one of the trees on the back porch! For services that are needed during your stay, there is a US Bank in Twain Harte, which has an ATM. There is also a full service grocery store in Twain Harte that includes a deli. There is a laundromat in Mi Wuk Village. It is next to the small convenience market in HWY108. For medical services, which include a hospital, this is a 20 minute drive to Sonora. There is a hospital on Greenley Road and an Urgent Care facility on Mono Way. We also have several wineries in the area for wine tasting. Along with snow skiing, there is a quaint indoor ice skating facility in Long Barn, which is 5 minutes from our home.